- The first game of the month saw the unbeaten academy side go to Norwich on the 5th, returning with all three points thanks to a 4-2 victory. Spurs got the break early in the first half when Norwich failed to clear a corner and Maghoma scored. Having struck the post earlier Georgiou scored from a pass by Akindayini. A minute later and a counter attack by Spurs was finished off by Oduwa. Norwich came closest to scoring when they struck the post just before the end of the half. Spurs continued to dominate in the second half, especially down the left where Oduwa and Ogilvie had defenders all at sea. Miller saw his volley crash against the crossbar before he combined with Ogilvie on the left to whip in a low cross for Oduwa to score his second and Spurs’ fourth. Spurs eased up looking to see out the game which gave the home side room to score two goals to make the scoreline look better for them. - On the 12th Spurs had a home game against West Ham at Hotspur Way. In a pre-season tournament both teams drew with West Ham winning on penalties. Although, it didn’t help matters that we lost our keeper through injury after the third kick. On the day the visitors were more up for the game than Spurs and won the game 3-2 to end our unbeaten run. They took an early lead when presented with an open goal after McGee's kick deflected off their striker. Spurs equalised when Pritchard headed home a rebound when their keeper parried from Akindayini. They regained the lead with a good attacking move down the right at the end of the half. Spurs drew level again from the penalty spot scored by Oduwa after he was brought down in the area. West Ham got the winner in the dying minutes to take the points. Scorers – Pritchard 14, Oduwa 80 pen. - We had another London derby on the 19th with Chelsea the visitors to Hotspur Way this time around. This was a tough test for the young Spurs side as Chelsea were very quick and physical. Spurs came out 3-2 winners opening the scoring on the counter when Ogilvie set up Miller. Ogilvie helped to release Akindayini to increase Spurs lead before Chelsea robbed Walkes to reduce the lead before half time. Chelsea started the second half strongly but after Spurs made changes to improve their foothold Pritchard set up Georgiou for Spurs’ third. Chelsea hit back quickly to reduce the lead but with the game opening up it became end to end. Oduwa won a penalty but hit his kick wide as Spurs saw out the game to go top of the Southern group. - There was a long trip up north on the 26th for the fixture with Newcastle United. With three games in eight days John McDermott had to rotate his squad of players and this match was fortunately against one of the weaker teams in the league, so we used it to rest some of the more experienced players. Midfielder Vincent-Young who was returning from injury was put into the back four with Ogilvie to protect him. The side struggled at times but got on top and were the better side overall. Spurs took the lead when a good run down the left by Georgiou ended with a cross that was finished by Harrison. The magpies equalised late in the half when they put the Spurs defence under pressure. Surviving early pressure Spurs got a second when Harrison was played through for a one on one with the keeper scoring at the second attempt. They then had to hold out as Newcastle launched a late assault as they did their best to throw everything at the Spurs goal. - Spurs last game of the month was the re-arranged trip to Aston Villa on the 30th. This turned in to a tough match, with the side eventually coming away with a 2-2 draw. Spurs took an early lead when Miller scored with a 20 yard free kick that he earned on the back of a great 30 yard run. From then on the home side gradually applied pressure until they scored. McGee made a double save before half-time to keep Spurs in the game. In the second half with a strong wind behind them Villa pinned Spurs in their own half. The wind was so strong McGee could not kick over the halfway line. Villa went in front and dominated the play looking for more goals. 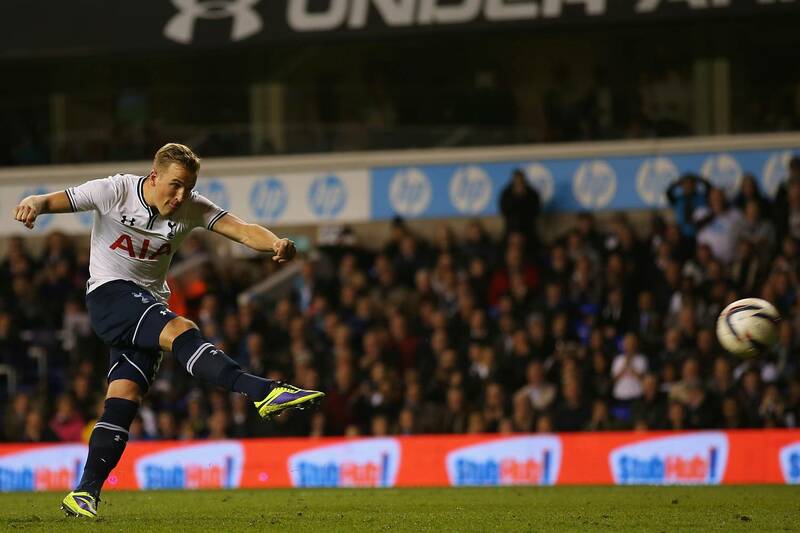 Spurs managed to break out a couple of times before the last minute when a quick throw-in sent Sonupe down the left. His cross was met by Maghoma, who had got up from the back, to slot home the point saving equaliser. Spurs end the month top of the group three points clear of Fulham. - October began with a friendly match at Hotspur Way on the 1st as a Spurs XI played a QPR XI, with the game ending 2-2. Rangers took the lead before McEvoy equalised having been sent away down the right from a Dawkins pass. Dawkins put Spurs ahead early in the second half after Darren McQueen had an effort saved. Rangers drew level from the penalty spot after Ball was adjudged to have handled. Spurs held on for the draw after an injury to Gallifuoco left them with ten men. - On the 8th Spurs traveled to the Langtree Park Stadium in St.Helens to play Liverpool. As it was an International break the squad was short of players so three U-18 players came in. It was not a good night for Spurs as they were well beaten by Liverpool who had players with first team experience involved and including Cissokho on loan from Valencia as an overage player. Spurs never got going as the Reds pressurised them from the off scoring five goals – Cissokho chipping in with three assists. Spurs did have a couple of good chances to score in the first half, which could have changed things, but their keeper saved both. - During the international break Spurs went to Spain to play a friendly against Athletic Bilbao on the 16th. They came away with a 1-1 draw having taken the lead in the first half when Lancaster scored having controlled a chest high cross from Veljkovic and hitting it on the turn. Oduwa had a goal ruled out for offside before Bilbao equalised in the second half. McEvoy and Lancaster also had goals ruled out. - On the 21st Spurs entertained Leicester City at Hotspur Way with the visitors including the maximum number of over-age players, two with full international experience, allowed in a game they could have won. The young Spurs side only had Kane and Fryers with higher experience. The visitors used a hands on approach of holding and pushing when challenging for the ball which upset the passing game of Spurs who also had to contend with a strong wind. Spurs did not get off to a good start conceding a penalty when Ball was beaten for pace and tripped Schlupp in the area. Spurs were level when Kane found McEvoy in the area who lashed in the equaliser with such power that the keeper could not stop it. Leicester continued to frustrate Spurs’ passing game getting bodies behind the ball while counter attacking at pace. Spurs had more possession in the second half creating more chances but the visitors also had chances to win the game.